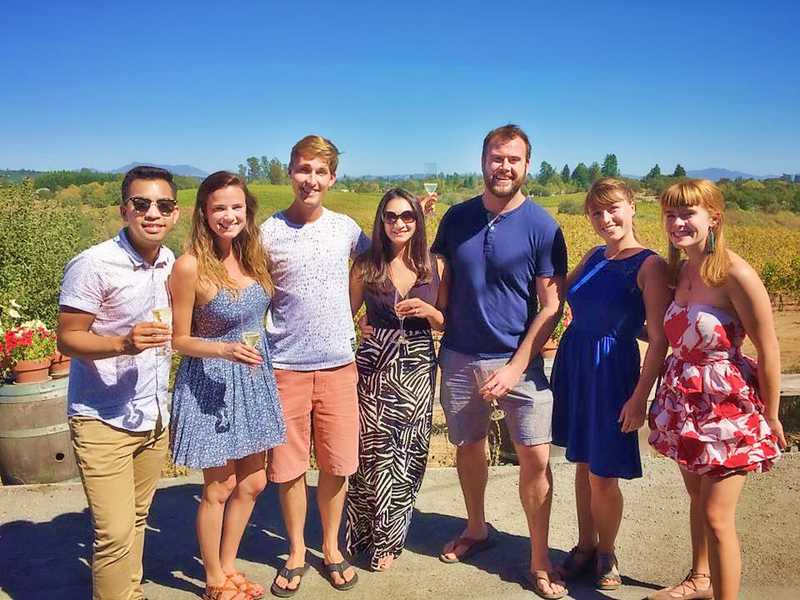 This September – aka Bay Area Summer – Side Note was hired to serenade a surprise proposal on the rolling hills of Iron Horse Winery in Sebastopol, CA. The couple, Hank and Tracy had just moved from the East Coast to the Bay, and while they didn’t have many local traditions yet, they knew they loved the winery and the song “All I Need” by AWOLNATION. Hank approached us with a plan in mind, and was open-minded as we also shared our experience in crafting an a cappella flash-mob proposal. We came up with a plan that flowed really well and was sure to amaze Tracy. We had 2 weeks to prepare – and realized we’d likely be missing a couple members! – but proposal events are so wonderful that we decided to make it work, by writing an unusual arrangement for only 5-6 voices rather than 7. Gayelan, Meredith, and Rebecca blended amazingly well on the song, allaying any concerns about missing voices… three part female harmony is sweet and classic, plus our beatboxer covered the bass as well as the beats! The tasting room – really an open-air tasting bar – was elevated ~30′ above the vineyards and the view plus the breeze were utterly perfect. We arrived early to try Iron Horse’s renowned Sparkling Flight which matched the summery day. Our client arrived shortly thereafter. After anonymously bumping into the couple and taking their picture, Side Note burst into song and turned the heads of every other patron at the vineyard! Our client knelt and delivered his brief speech, she said yes (of course!! ), and all 20 patrons cheered wildly as the couple kissed, hugged, and cried together. These occasions are pure magic, and Side Note is always honored to be included. Congratulations to Hank and Tracy on their engagement!